A Horror Beyond Belief… Breathing Hate, Death And Destruction! Psychotronic Western/Horror movie about an American cowboy living in Mexico who discovers his missing cattle are being preyed upon by an Allosaurus. The Allosaurus would later attack local villagers in a town, and eventually be destroyed by getting lured into some quicksand and drowning. 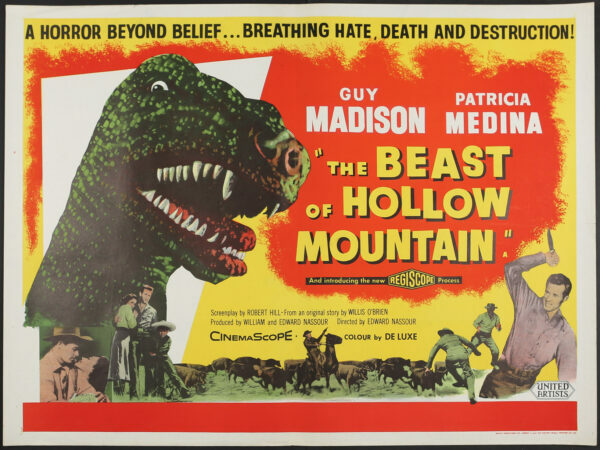 Starring Guy Madison and Patricia Medina.